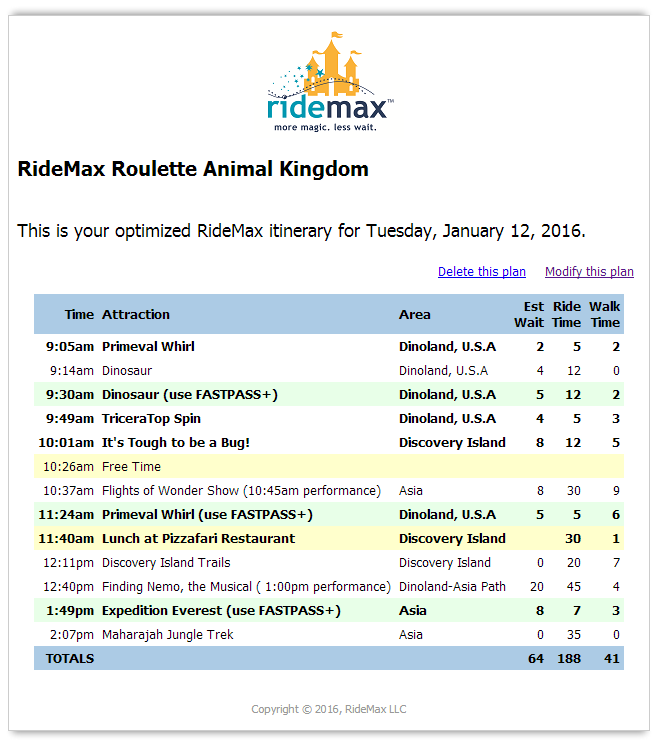 I’m heading out tomorrow (Tuesday, January 12th) for another round of RideMax Roulette, this time at Disney’s Animal Kingdom. Feel free to follow along as I send out live tweets and Facebook updates throughout the day. Who knows, I may even try out that Periscope thing for a ride on Expedition Everest or something. You can find me at the Periscope username @RideMax4Disney. For those who’ve followed the blog for a while, you know that RideMax Roulette is a sort of game where I choose a set of attractions at random, and plug them into the RideMax optimizing software. I then take the resulting plan to the park to see how well it works out. Playing this game gives me a good chance to test the plans RideMax comes up with, as well as — quite frankly — forces me to visit attractions I might not otherwise be all that inclined to see. One additional goal with tomorrow’s plan is to check out the new Pizzafari restaurant, something I haven’t done since it came out of refurbishment a little over a month or so ago. Josh over at easyWDW did a write-up on this recently, which has me intrigued. 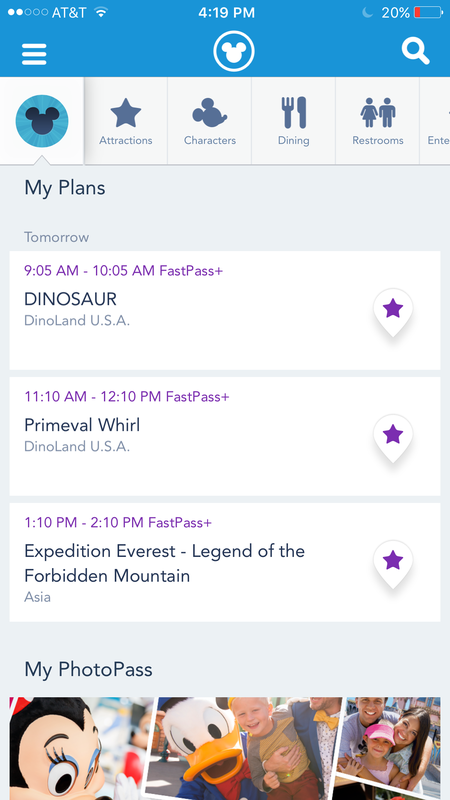 For FastPass+ selections, I decided to tell RideMax I wanted to use FP+ at Dinosaur, Expedition Everest, and Primeval Whirl. I also plugged in a lunch break at Pizzafari, and RideMax came up with the following game plan for the day. We’ll see how this actually works out in practice, but on paper, it looks pretty decent, with just an estimated 64-minute wait to visit 11 attractions, or just six minutes per attraction. Even if you take out the two zero-wait “walking” attractions — Discovery Island Trails and Maharajah Jungle Trek — the average wait is still just a hair above seven minutes each, and that assumes we arrive 20 minutes early to wait for Finding Nemo. Overall, this looks like a great day with very little wait. Note that if I hadn’t been able to secure the FP+ reservation times shown in this RideMax plan, I would have used the new feature added recently to RideMax which allows me to specify the times at which I want to use my FP+ reservations, and had RideMax recalculate accordingly. So, wish me luck on my quest tomorrow. Again, feel free to follow along on Twitter, Facebook, or (possibly) Periscope @RideMax4Disney. I also welcome any guests for lunch at Pizzafari if you’re free at the lunchtime shown on the RideMax plan. Hi! On the Disney World website and other places, it says that after the arrival window of your 3rd FP+, you can then get another FP+. When that arrival window passes you can get another FP+ and so on. But on my ridemax plans, it isn’t telling me to get more FP+’s. Why is that? When do the later FP+ selections run out at other parks? And does that include Thunder Mountain Railroad? Thunder Mountain as a fourth FP+ would be iffy I think. You might get one later in the evening on less busy days, but if it’s too late, you really wouldn’t need FP+ at that time of day anyway. The attractions where this might come in handy would be the super-high capacity rides, like Pirates, Buzz Lightyear, and it’s a small world. The other advantage of using it on these (rather than Big Thunder) is that the return window could be very soon after obtaining the FP+ reservation, allowing you to obtain yet another one as soon as you finish riding. 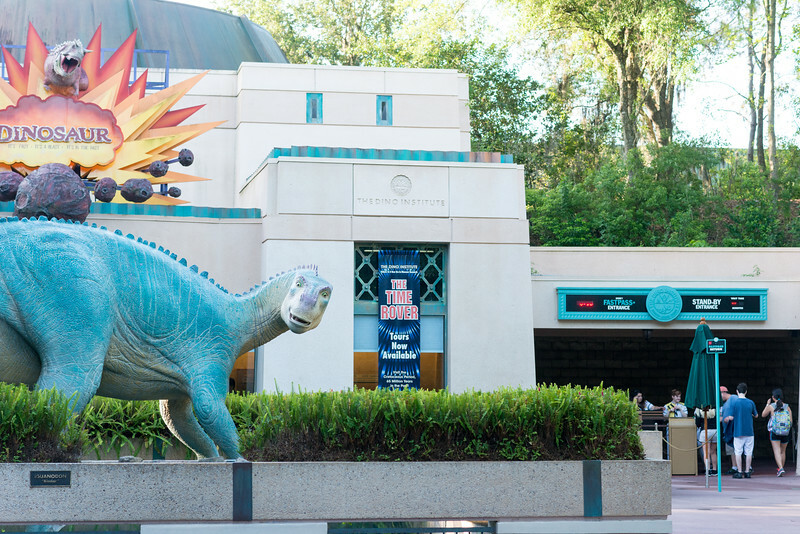 What is it like at other parks? For Star Tours and Tower of Terror, would FP+ run out early for them?